If you had a good summer season with your geraniums and would like to plant them again in the spring, dry them out over the winter and preserve the geraniums for replanting. To dry your geraniums over the winter, you’ll need a basement, attic, garage or other indoor space that is cool and dry. According to home and garden expert Danny Lipford, this method works best with mature geraniums that have thick, sturdy roots and stems. 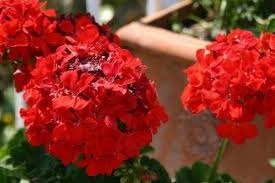 Remove the geraniums from the flower bed with a spade or your hands. Brush off all of the dirt that clings to the roots and stems. Place each plant in a paper bag, or tie a string to the main stem of each plant and hang it upside down in the storage space. Plants in paper bags can be laid on their sides and stacked two or three plants high. Soak the roots of each geranium plant once a month until the roots are soft and pliable. Allow the roots to dry out in a warm space before re-bagging or re-hanging the plants. While they are drying, prune off any dead stalks or leaves. Replant the geraniums in spring when the danger of frost has passed.